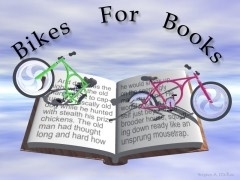 The Masonic Lodge of Vassalboro will be sponsoring the Bikes for Books program again this year! The program will run from April 11th-May 14th.With bikes presented at the annual spring concert on May 27th. There will be 4 bikes for each grade level(2 boys/2 girls) from Pre-K-2nd grade. There will be 28 bikes in all!